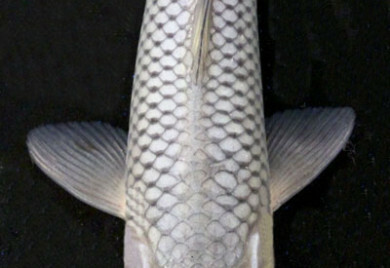 Soragoi, similar to Chagoi, are koi of a solid grey or silver color, combined with a subtle net pattern. Also like Chagoi, mature Soragoi are very docile and will be among the first koi in your pond to learn to hand feed. Chagoi and Soragoi: Are they the same? This is one of the questions that have been recently put to me; in fact Chagoi and Soragoi are separate types. Chagoi is a product of the Taisho Era, while Soragoi did not make its appearance until the Showa Period. However, the two are closely related. 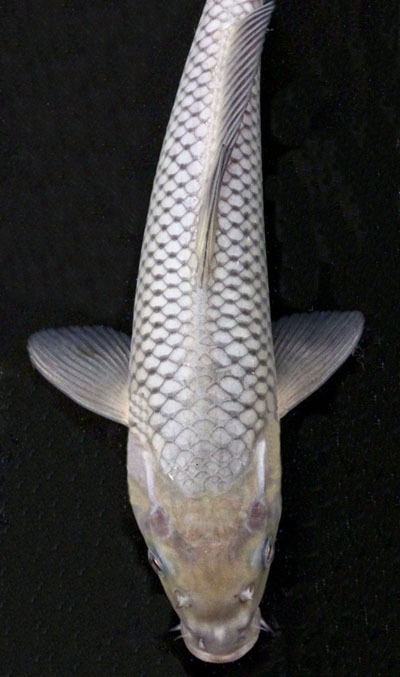 Soragoi belong to the Ogon group of koi, which appeared in the Showa Period (1926-1989). Soragoi is an abbreviation for Sora Ogon. Colouring ranges from a pale ultramarine to a deep sky-blue. Characteristically the scale edges are more pronounced than they are on the Chagoi. There can be shine (Hikari) on the top of the head and the fins, but this is not prominent. Now Ogon was produced from Kin Kubuto, which was originally produced from Chagoi so that Soragoi, which is an offshoot from Ogon, has Chagoi as its ancestor; this is why we can say that the two are closely related. Variations of Soragoi include Gin Rin Soragoi and Doitsu Soragoi. A leader in Pond Fish – A Leading Supplier of KOI For Ponds!